Watercolor is great for creating wood texture in your paintings. Wood texture can be very realistic and it will add interest to any painting. Besides adding interest painting wood texture is fun! Below are 2 examples of wood texture using different colors and I have a recent video demonstrating how I paint wood texture. The color choices are endless. So let’s start creating wood texture in watercolor. Note: This is an updated blog post. The original post was from December of 2008! Start by wetting the paper and laying in a wash of several shades of brown and grey. Similar to the image below of brown wood with a little raw sienna or yellow ochre for warmth. If you want a red colored wood look at the image to the right. Here you have reds, violets, blues and even some green! Click on the image to enlarge to get a close look! No need to be perfect, let the colors merge and blend. Let this step dry. Fan out a 1″ flat brush that has just a small amount of dark brown paint. By separating the hair into irregular gaps you can create a dry brush effect that works well for wood grain. Lay the brush out flatter than usual and drag the brush across the paper in the direction of the grain. In the image to the right I dragged the brush around where I am adding wood knots. Add variety with color change and using a wetter brush on some planks. Even skip over areas, like in the blue plank on the right. After you have finished the wood grain texture, paint in some knots with dark brown. Look at the images to see the dark brown knots in the wood. Don’t make them all the same shape or size. Variety is important for a realistic wood graining effect. Using a dark brown or a mixture of ultramarine blue and burnt umber paint the gaps between each plank of wood. Paint different widths and make the lines uneven and thicker in some places and thin or even skip the other areas. After the watercolor paper is dry scrape in highlights with a pocket knife or razor blade. Another watercolor technique is to lift out color for the the highlights. With a moist brush go back and forth over an area then dab with a ppaer towel to remove color. The example to the left has highlights around the knot in the middle by removing some of the paint. Add nail heads that have been used to fasten the wood planks. Here I have dark nail heads. Sometimes I even add highlights on a few of the nails. In conclusion, I have given you a variety of techniques for creating wood texture in your next watercolor painting. 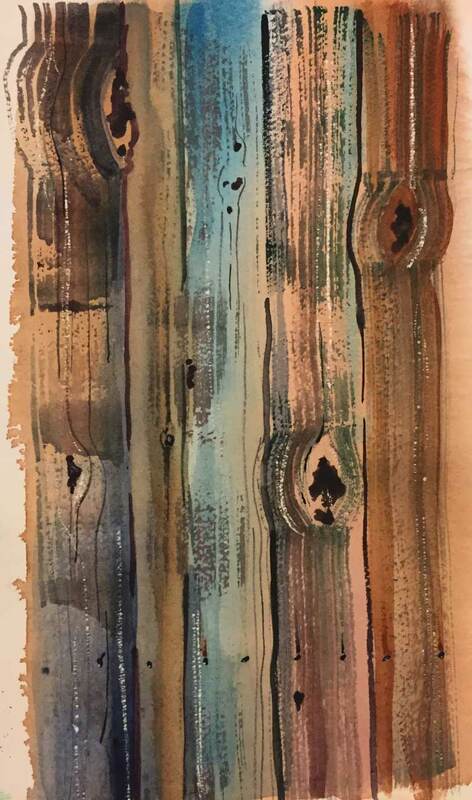 Here is a link to a painting of mine that I used these same wood texture techniques on an old wood building and water wheel. Try some of your own wood texture on scrap pieces of paper. Practice using some of the techniques from the video or from the written description above. When you get the hang of this try it in a painting. Please share any comments or questions below and please forward or share with friends. Above all else, Have FUN! I like the wood texture video. It will help me start my barn painting. Thank you for hating your talent. Thanks Brenda! One of my goals for 2018 is to make more videos. Let me know if there is a technique you would like to see. grat Video! thank you, I love to paint wood!! Thanks Martha! Glad you enjoyed the video. Wood and watercolor go well together. Hope to be posting more “how to” videos soon.